Rebbetzin Feldbrand fans, rejoice! And all you others out there who aren’t familiar with this beloved author’s style, listen up! 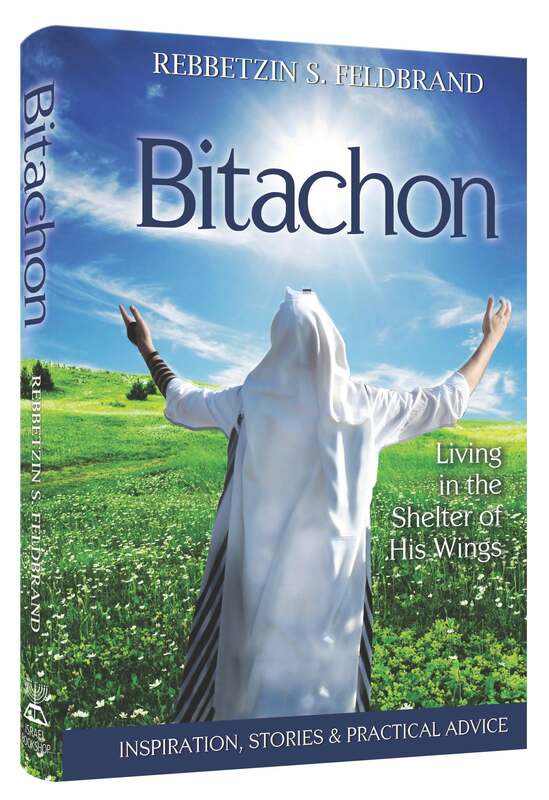 Bitachon, Rebbetzin Feldbrand’s ninth book, has just been released. Bitachon is filled to the brim with all sorts of practical strategies to help you acquire just that—bitachon in Hashem. You’ll love the stories and real-life examples that the author brings, which are all extremely helpful in modeling how one goes about acquiring this vital middah. As we go through life, we see more and more how essential it is to have bitachon. Whether regarding getting a good mark on your Chumash test (if you’re a kid), or coming up with the money to pay the rent or mortgage each month (if you’re an adult), it’s clear that the happenings in our lives are not in our control. So why bother worrying about anything at all? Let’s all just—as the saying goes—“let go and let G-d!” With Hashem as our Driver, we’re in the best hands possible—so why not just trust His driving skills and sense of direction? With Bitachon as your guidebook, you’ll learn exactly how to do so—and how absolutely amazing the dividends of it are! There are certain factors which lead to despair. When a person is overwhelmed with suffering, he finds it difficult to believe that salvation is at hand. When a person requires something that would require a miracle, like having a disease disappear or acquiring something beyond his reach, he should still daven to Hashem to save him. Knowing that one has sinned should not prevent the individual from turning to Hashem. A person should never give up hope (Yefas Toar). Israel Book Shop presents Chapter 3 of a new online serial novel, Divided Attention, by Esther Rapaport. Check back for a new chapter every Thursday or Friday. Click here for previous chapters. Ayala’s green notebook became filled with her close, neat handwriting. I held the list in my hand. Auerbach, Arnon, Ben Shlomo, Badani, Guttenberg… They were all new names. I didn’t recognize a single one of them and did not know which of the faces sitting before me belonged to which name. I observed a few faces that had closed expressions, as though these girls had made a firm decision not to enjoy a single thing that happened there. I didn’t know if they were the girls who had been accepted to the old school and had been forced to switch, or perhaps they were the girls who hadn’t been accepted anywhere. For me, they were all new, sweet girls. New faces, a new page of new names, in a brand new attendance book. At the back of the classroom, a diminutive figure sat up straight. Why had she chosen to sit so far back? I was inclined to tell her to change seats with someone sitting closer up front, but at the last second I remembered that I’d better get to know her first, at least a little, before I made any changes. Do these parenting scenarios sound familiar to you? When you read them, do you feel like saying, “Oh, my goodness, that’s me!” or “How did they know?! That’s my child!”? If so, you will find a new friend for yourself in Kids…will be Kids! The above true-to-life examples are only a sampling of the parenting questions addressed to Mimi Schechter Kleiman, RCSW. In Kids…will be Kids! 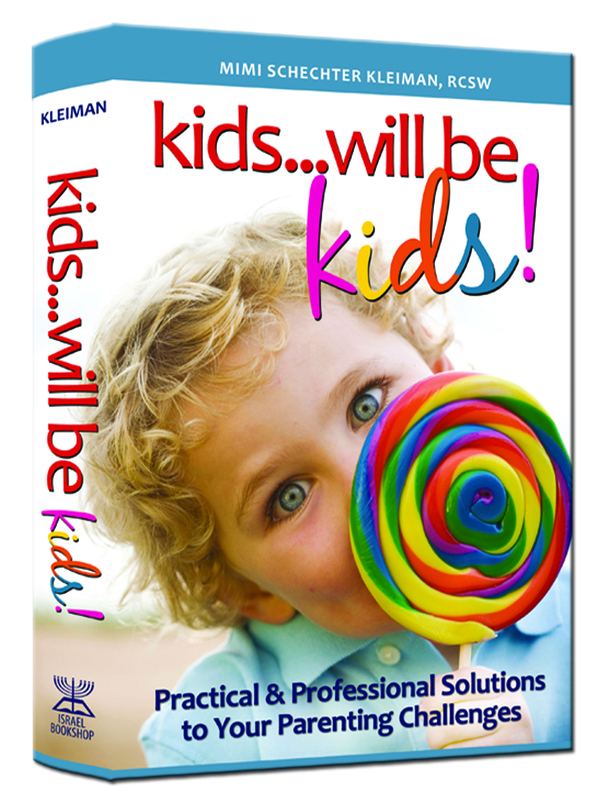 Mrs. Kleiman, a practicing therapist and social worker in the greater New York metropolitan area for the past twenty years, skillfully and sensitively answers dozens of common parenting questions. She starts by explaining the “why” of the problem and then goes on to share her secrets for how to successfully resolve the issue. You’re a good parent. We all know that—and (hopefully!) so do you! So do a favor for your kids and for yourself. Pick up a copy of Kids…will be Kids! and watch Mimi Kleiman’s magic begin to spread to you and your family! How can I get them to stay in bed? For the past few years we have been spending our summers in the country. The one thing that is a hassle for me is getting the younger kids to go to sleep when so many of their friends are still playing outside. During the year I stick to a tight schedule. All the kids, except for my oldest daughter, who is now 12, are in bed by eight o’clock. I am basically a night person, and when the kids are asleep I get all my work done in peace and quiet. Now, during the summer, after running after the little ones all day, I look forward to sitting out with my friends and relaxing in the evening. I don’t have patience for the hundreds of excuses my kids always have for getting out of bed — chief among them that other kids are still outside playing so why do they have to go to sleep so early. If I let them stay up later, they don’t get up in time for camp the next day. Then I have to rush them out or they’ll miss the camp bus. How can I get them to stay in bed and go to sleep on time, for everyone’s benefit? At this point you start fumbling with your lines, wondering how to respond (you must not have done a good enough job memorizing your script!). Maybe your kid does have a point there. It’s true that the amount of quality Jewish literature out there—novels, short stories, biographies, and everything in between—has grown in recent years by leaps and bounds, at least compared to how it used to be a mere decade or two ago. But to find quality literature appropriate for and of interest to a preteen-aged kid—now that still presents a challenge. That’s why The Adventures of the Levy Family series is such a breath of fresh air. 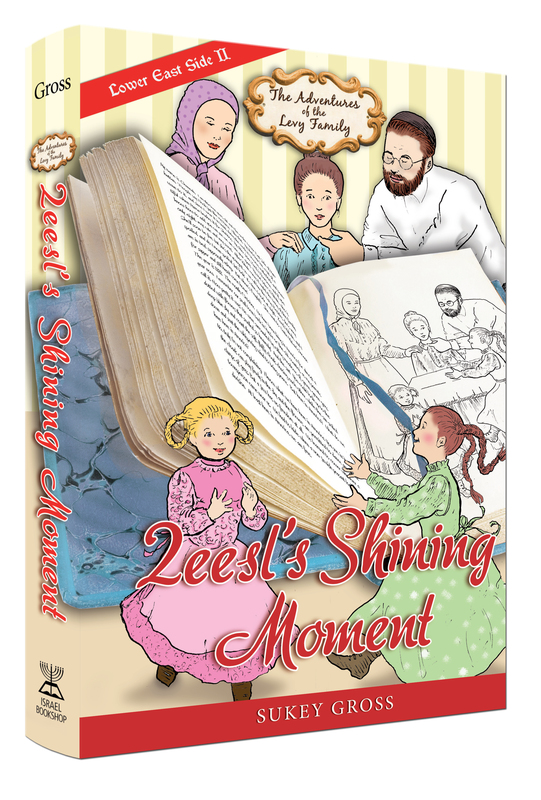 Each historical novel in this series is fun and exciting as it is educational, and your kids will just devour these books. Whether in Channah’s New World, where they’ll read with bated breath about the terrifying and dangerous flood that threatens Channah’s family in Johnstown, PA, or in Zeesl’s Shining Moment, where they’ll relate to fifteen-year-old Zeesl ‘s trepidation and anticipation at landing a teaching job in Woodland, New Jersey, the books in The Adventures of the Levy Family series will keep your kids spellbound and coming back for more! Buy these books for your kids. Your kids will thank you, and best of all, you’ll have found a solution to the “Ma, I’m so bored”-Shabbos-afternoon problem! Israel Book Shop presents Chapter 2 of a new online serial novel, Divided Attention, by Esther Rapaport. Check back for a new chapter every Thursday or Friday. Click here for previous chapters. Eight-year-old Avi looked at the note. The atrocious handwriting was very familiar, a little too familiar. But how had Ronny gotten a hold of this? And what did it say? “Do you know who wrote this?” Ronny’s gentle tone did not fool Avi for a minute. His big brother was angry, and he, Avi, was undoubtedly his intended victim. The older boy crumpled the note into a little ball, but then reconsidered. He smoothed out the creased paper and put it into his pocket. Avi laughed nervously. Ronny was asking him the impossible. “Get him? I can’t,” he said uneasily. Anyone out there made a bris recently? If yes, first of all mazel tov, and secondly, I’d like to ask you a question: Did you understand all that was taking place at the bris? Don’t worry; you don’t have to respond, and I’ll never know if you did or not! But seriously, so many fascinating minhagim take place at a bris—minhagim that we all know about, but rarely know the reason behind them. For example, did you know that the reason the honor of kvatterin is given to a husband and wife is based on the idea that bris milah is compared to marriage, because through the milah the baby is betrothed to Hashem? And that one of the reasons why the bris milah takes place on the eighth day is because right before the baby is born, an angel taps him on the mouth and causes him to forget all the Torah he has learned inside the womb, so there first is a seven-day mourning period because of all this forgotten Torah? In Bris Secrets, you will find all of this information—and much, much more. 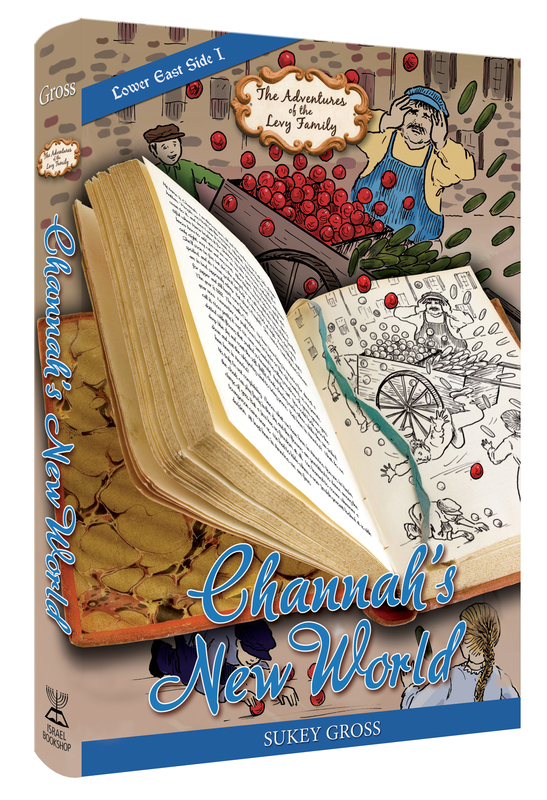 From the common minhagim to the unusual ones, be they the customs of Ashkenazim, Sephardim, or Chassidim, you will find all the what’s and why’s of a bris milah in this handsome book. Also included is a section on the birth of a baby girl, which is comprised of the various customs pertaining to naming a baby girl and the celebration of a kiddush, as well as the reasons behind these customs. 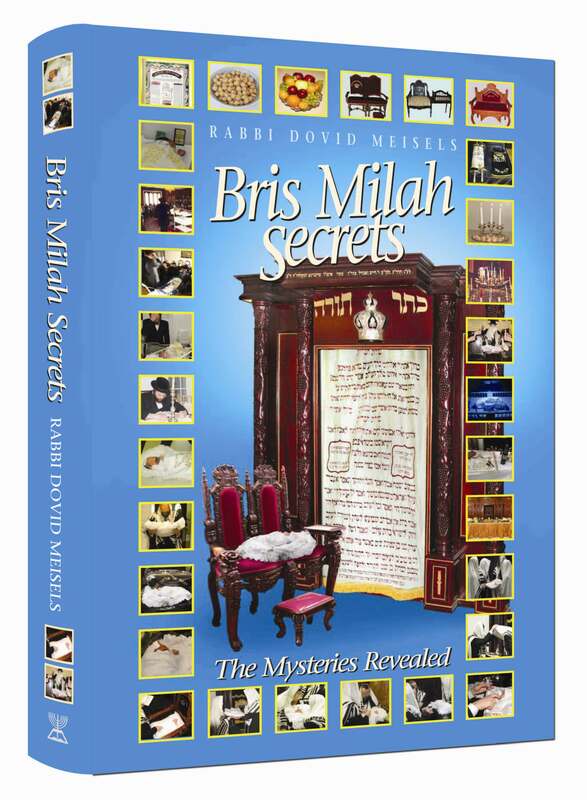 So whether or not you already made a bris, have one coming up, or are just curious about the in’s and out’s of this special mitzvah, be sure to check out Bris Secrets! Also makes a great gift for your relatives and friends who are making a bris or a kiddush! 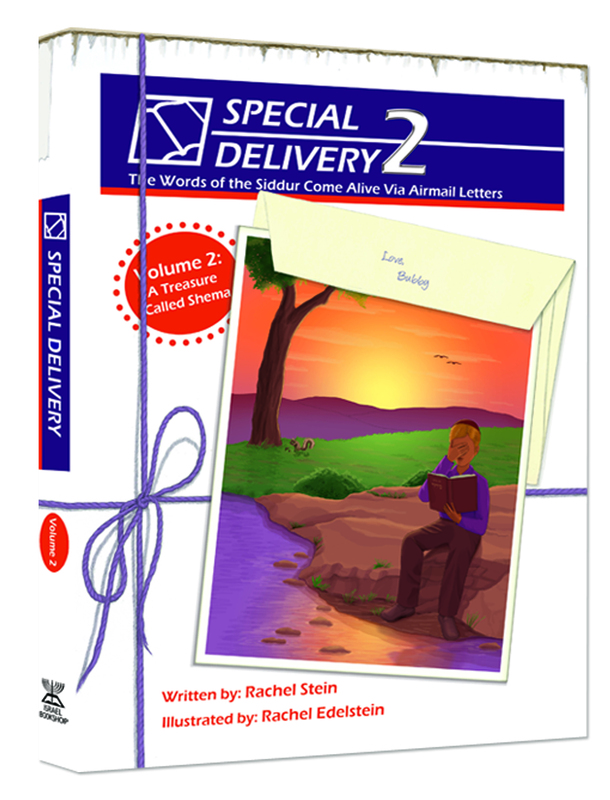 On the heels of the successful release of Special Delivery 1 (Birchos Hashachar), it was hardly surprising that Special Delivery 2—on the Shema—hit the shelves of the bookstores so soon afterward. There’s something so beautiful about this series, so irresistible, that you just want to buy each Special Delivery book for your kids. These books are simply gorgeous! Each illustration is so striking and realistic, it can take your breath away to just look at them! Of course, the content of the books is of the highest caliber; doesn’t every parent dream of teaching his or her children the beauty and the meaning of the tefillos we say each day? And when the lessons are being served up to your children in such an appealing way, with these stunning full-colored pictures, your kids are sure to love these books as much as you’ll love them. Click here for some sample pages.